There is often a paradox in the conventional medicine’s dealing with thyroid disease. What I see from my perspective as a Naturopathic Doctor is that thyroid conditions are largely under-diagnosed and over-medicated. It is my goal over the next series of blogs to help you understand how this is by educating you on all things thyroid-related. This includes the very basics of thyroid anatomy and physiology to create a foundational understanding, the details of testing and evaluating thyroid conditions (and why standards-of-care here are inadequate), the highlights of the main categories of thyroid disease (Hashimoto’s, Grave’s and primary hypothyroidism) and, finally, a functional naturopathic approach to addressing these conditions. Sometimes it feels like thyroid issues are the core of my practice. Nearly every day I see a patient with Hashimoto’s, Grave’s, or hypothyroidism. This isn’t really surprising because the American Thyroid Association (ATA) estimates that nearly 20 million Americans have a thyroid condition – and this even is with the inadequate screening labs most practitioners use to evaluate thyroid function. There are many more individuals suffering from thyroid-related conditions that go undiagnosed and, therefore, untreated. What is the thyroid gland? Where is it? Can I feel it? The thyroid gland is a part of your endocrine system so it makes and responds to a variety of hormones. It is shaped a bit like a butterfly, is located in your neck, and can weigh anywhere between 20 and 60 grams (which is about the weight of 4 to 12 US nickel coins). You can find it by holding your head in a neutral position and running your finger down the front of your neck. Just before the midway point you will feel a prominent band of cartilage. The central portion of your thyroid is a thin piece of tissue just below this. If you hold your trachea (the tube you are feeling) with your thumb and pointer finger, you will essentially be feeling your thyroid. You don’t feel anything? Good! A normal thyroid gland shouldn’t be easy to feel by the inexperienced. 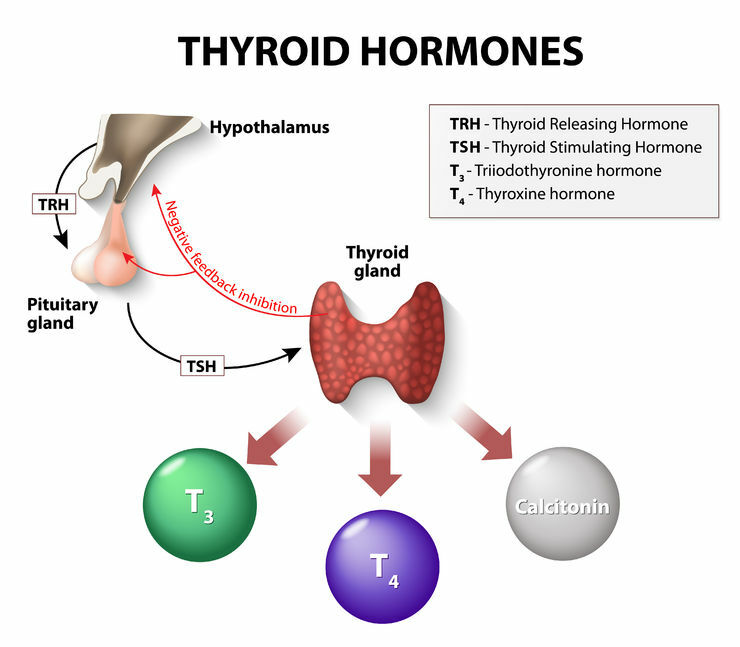 What are thyroid hormones and what does they do? 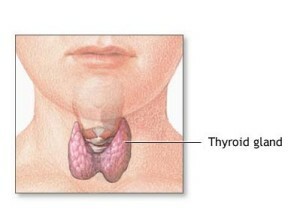 Your thyroid gland produces two types of thyroid hormones: triiodothyronine (T3) and thyroxine (T4). T3 and T4 are utilized by every tissue in your body and can therefore impact the function of essentially every organ because they regulate the metabolism of your cells. Looking at the range of symptoms a person can experience if thyroid function is too high or too low helps us appreciate how important thyroid hormones are to the functioning of all of our cells. Both T3 and T4 are made of the amino acid tyrosine and the mineral iodine. T3 has three molecules of iodine and T4 has four molecules of iodine. T3 is much more biologically active than T4, meaning that your cells are able to use T3 much more easily than T4. The thyroid gland produces lots of T4 and just a little T3. T4 gets converted to T3 by tissues throughout the body, and by the liver in particular. 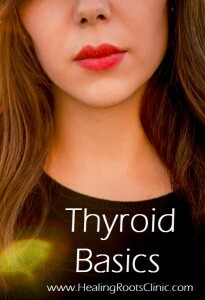 What are some symptoms of thyroid dysfunction? First it is important to know that your thyroid can be out-of-balance by under-functioning and producing too little T3 and T4 (this is called hypothyroidism) or by over-functioning and producing too much T3 and T4 (this is called hyperthyroidism). There are autoimmune versions of both called Hashimoto’s and Grave’s Disease, respectively. Hashi’s and Grave’s have hypo and hyper symptoms respectively. These two lists of common symptoms come from the Office on Women’s Health. Because thyroid hormones are used by every cell in your body, symptoms can be experienced virtually anywhere in the body. The symptoms listed above are just the most common. If you can check off several in one of the lists, even if your thyroid has tested “normal,” you may have an imbalanced thyroid. Why might your thyroid lab look “normal” but you have some of these symptoms? If you’ve had a thyroid lab done by doctors practicing conventional medicine, it’s most likely that they tested only for thyroid stimulating hormone (TSH). As discussed above, the results of T3 and T4 are necessary to give us a complete picture of thyroid health. In The Thyroid Part 2 – Five Reasons Why Testing Only TSH Isn’t Enough, I discuss why so many people have uncomfortable symptoms related to their thyroid and why I believe it’s under-diagnosed. In The Thyroid Part 3 – Do I Have to Stay on Thyroid Medication for My Whole Life?, we’ll find out why so many doctors over-medicate thyroid issues instead of addressing the underlying problem.